To ensure supply of its digital currency, XRP, Ripple will place 55 billion XRP into a secure Escrow account by the end of 2017. To build trust and liquidity, Ripple aims to remove the uncertainties about the distribution of XRP. 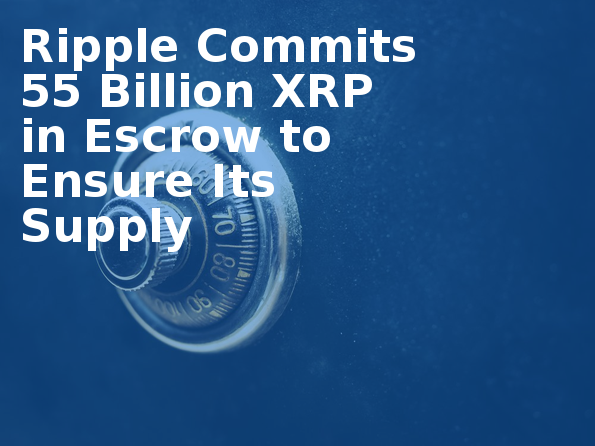 Escrow will allow parties to secure XRP until the transaction completes and required conditions are met. Ripple will establish 55 contracts of 1 billion XRP each. Each contract will expire on the first day of the month for 55 consecutive months. After expiration, the XRP will become available for the Ripple’s use. Ripple will return the remaining XRP to the Escrow account. Controlling Stake Ripple lets the investors verify the maximum XRP supply that can enter the market by securing the largest share of its digital currency. An XRP sender can set conditions for the completion of the transaction. The amount will stay locked cryptographically until the conditions are met. Ripple will use XRP to incentivize the market makers. Market makers offer tight payment spreads and sell XRP to institutional investors. Use Case Ripple’s CEO, Garlinghouse claims that XRP is the only digital currency with a clear use case. It offers an efficient and practical method for payment processing across the globe. Bitcoin, however, has reached its limits for processing transactions and losing its market share. Ripple is designed to be used by large institutions and enterprises for cross-border payments and on-demand liquidity. Payment providers and banks who use XRP will enjoy better access to emerging global markets with lower settlement costs. Ripple stays committed to decentralization of its ledger and improving the liquidity of its digital currency, XRP. Escrowing will help Ripple in ensuring that it achieves its goals. Bitgo has partnered with Ripple due to its strength to bring large financial institutions together. Ripple’s lockup of 55 billion XRP indicates the commitment Ripple has towards creating a healthy ecosystem for XRP and its use. Internet Of Value Ripple has shared its vision of Internet Of Value in which currency flows like information flows today. It is necessary to lower the costs of payments to realize that vision. XRP can provide a highly liquid medium for large financial institutions and play the central role in the emerging markets. To make it possible, building trust and utility is essential, for which this move can play a pivotal role. There have been concerns about the XRP distribution in the market. The notion that Ripple can sell its 61 Billion XRP in the market anytime has surfaced the minds of many investors. However, Ripple’s interest is aligned with building and running a healthy XRP market. By placing 55 billion XRP to escrow, Ripple removes such uncertainties permanently. XRP’s Growth In the last few months, XRP has grown tremendously in market capitalization and volume. Ripple has been selling more than 300 million XRP per month for many months. The escrow move provides a level of certainty and predictability which is good to ensure a stable demand for the digital currency in the market. To Sum Up Ripple has made a wise decision by addressing the concerns of the institutions and investors about the remaining XRP’s not being in the circulation. Escrowing will provide stability to the digital currency, help avoid price manipulation and build trust. The level of predictability offered by escrowing is good for boosting investor’s confidence and protect their interest. Great info , thank you . where do i buy the XRP ?